“Nancy Friedemann-Sanchez: Palimpsests” is the current exhibition being featured in the John A. Day Gallery, which hosts many exhibits throughout the year that feature both students and visiting artists. Nancy Friedemann-Sanchez is a Colombian artist that now lives in Nebraska. She said the artwork featured is part of her visual novel that she has worked on while living in the Midwest. “It’s a narrative about migration and of living between two languages and cultural memory,” she said. Friedemann-Sanchez is from Bogota, Columbia, where she also studied art at La Universidad de Los Andes in Bogotá. She then studied at Otis Art Institute in Los Angeles before traveling to New York to get her Masters degree from New York University. She has now lived in Nebraska for the past seven years. Amy Fill, Interim Gallery Director, said she was drawn to Friedemann-Sanchez’s art when she saw it at the Bemis Center for Contemporary Arts in Omaha, Neb. That was when she and the former Gallery Director decided to feature Friedemann-Sanchez’s art at USD. 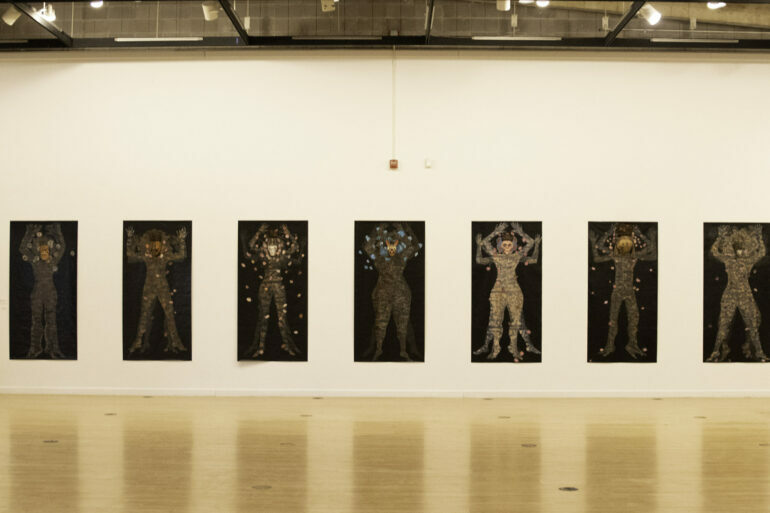 Friedemann-Sanchez said her work has been exhibited in galleries and museums in the United States, Colombia and Europe. Cory Knedler, Chair of the Department of Art, said having someone like Friedemann-Sanchez featured in the university galleries is important for students and the community. Friedemann-Sanchez has an art career that spans thirty years, but she said she’s been an artist for as long as she can remember. Friedemann-Sanchez said she is on chapter five of her visual novel and the art displayed in the gallery is an intersection of different chapters. On Jan. 17, Friedemann-Sanchez will be a visiting artist on campus as she speaks about her art before the closing reception later that day. Knedler said it’s a great opportunity for the art department to have someone like Friedemann-Sanchez come speak.